"Leafcutter Bees" refers to bees that use leaves and flower petals to make their nests. 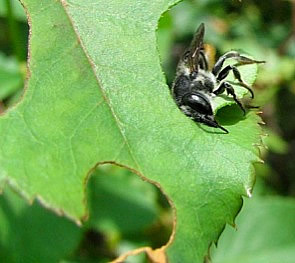 There are approximately 140 known species of leaf cutter bees found in the United States. They were originally introduced to western Asia in the 1930s for the purpose of commercial pollination of alfalfa. Return to our Bee Homepage for more information on other kinds of bees. They are black with white or silvery hairs on their body. The female can be distinguished by the dense brush of hairs that is bused for carrying pollen to the nest. The leaf cutter bee uses the leaves to line her nest in an opening about the diameter of a pencil; usually in a convenient small hole, crack or crevice, hollow tree, old mason wasp nest, bird nest, snail shell, or holes in wood created by boring insects. Solitary species of bees; each female builds her own nest independently. Leaf cutting bees range in size from small to moderately large; usually 1 to 2 cm long. Occasionally cause minor and /or temporary damage to certain ornamental plants if there large numbers of females nesting in an area. The bees cut leaves in a circular motion; usually a 1/2 inch circle from landscape plants such as roses or bougainvillea. If you need more information or have a problem with any type of bees please call us and one of our professionals (bee control is their specialty) will answer any question you may have or send a bee exterminator to assist you. NOTE: We have some of the most qualified bee exterminators in the field and can be dispatched all over the State of Arizona although we are based in beautiful Scottsdale. Find a local pest control professional in your area.